Here are my best tips for sewing with this cuddly plush fur fabric; cutting, pinning, sewing, pressing, quilting, binding, care and cleaning. 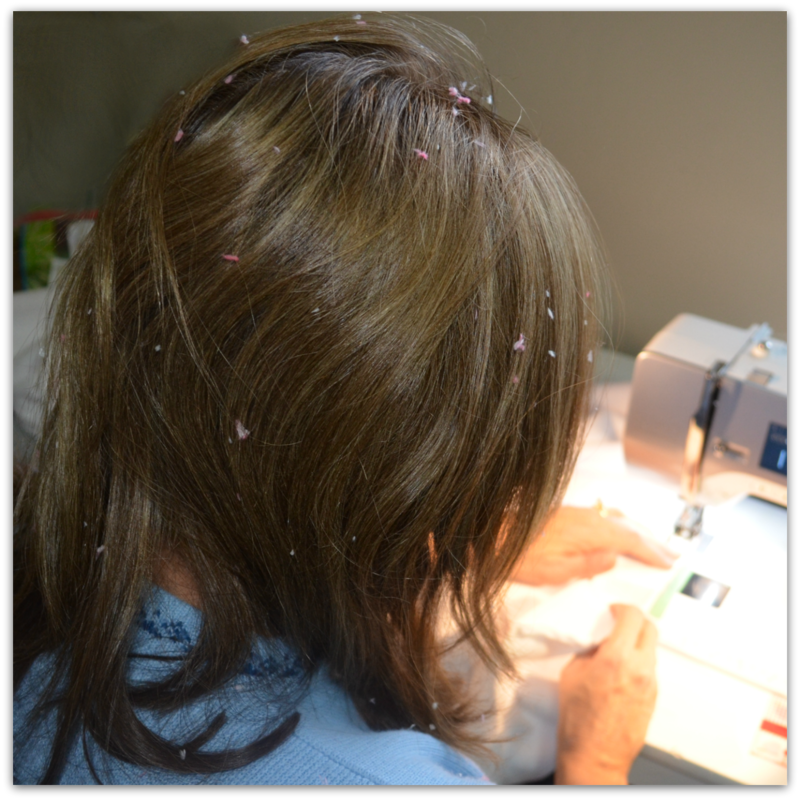 My hubby had a good laugh as he came down to the sewing room and snapped this pic. 2) Pinning: Face it, this stuff is so soft it’s slippery! Basically, pin it to death. This stuff also has a "nap", especially noticeable with a shorter length of fur. Feel it with your hand to determine which direction you want the nap to run. One direction is smooth, the opposite direction will make the pile stand up against the grain. If pinning is not sufficient, try using a glue stick to baste edges together. 3) Sewing: Use a bit larger needle, size 90/14, ball point. For stitching, refer to #2. Pin, pin, pin. Remember the nap? This stuff will often slide in the direction of the nap. When stitching two layers together, it helps if the nap is traveling in the same direction. If you are sewing minky to a layer of cotton, put the minky on the bottom so the feed dogs can do their job. Sew slowly and carefully so as not to stretch the edges. You may need to tuck in the furry ends so you can easily see to line up the edges. 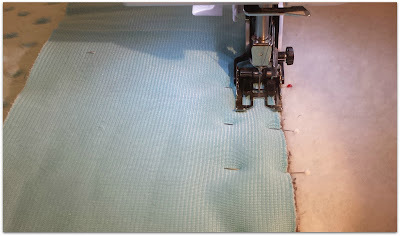 And, if you happen to have a walking foot with upper feed dogs to help feed the fabric under the needle evenly with the lower feed dogs, you will have even better luck sewing this stuff. If you are piecing large pieces together, say for a quilt backing, stitch along the lengthwise grain if possible, as it has less stretch. Again, check the nap, then pin, pin, pin! Or go and buy the 90-inch stuff for your backing, relatively new on the market. 4) Pressing: NOT recommended. Since this product is polyester, it should be relatively wrinkle-free. Don’t iron directly. Press from the back with a damp press cloth or piece of muslin. If you iron on the front, you may end up with an iron-shaped imprint. Also, try to resist ironing super-textured plush fur such as the dimple dots or rosebuds, as ironing will flatten out the texture. Trust me. :) You may also throw it in the dryer with a damp cloth on low heat for about 10 minutes to release the wrinkles. 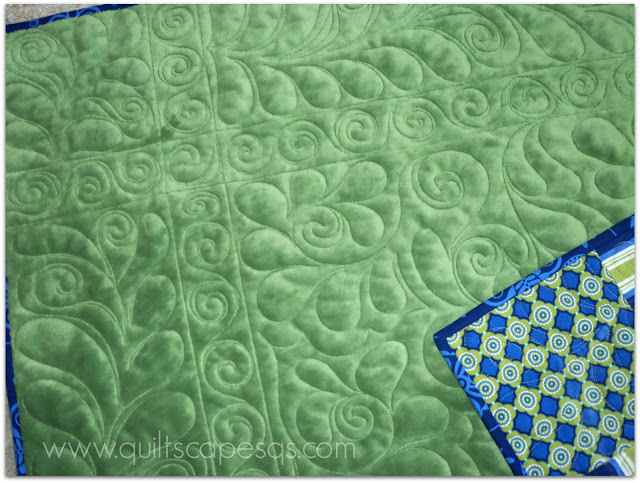 5) Quilting: I admit, I love quilting with this stuff because it really shows off the machine-quilting! I also prefer to quilt a little less densely so the loft can come through and be truly cuddly, like a warm hug from grandma. When setting up for longarm quilting, keep the lengthwise grain (selvage edge) at the sides with the stretchy cross-grain pinned at the top and bottom. Use lots of pins, minimal space in between, say every 1" to 1-1/2". Make sure the nap is vertical, heading from top to bottom of the quilt, so when you take up the quilt you're not going against the grain. If quilting on a domestic machine, spray-baste or pin-baste your layers together and quilt using a walking foot. For freemotion quilting, drop the feed-dogs and use a darning foot. Quilt with confidence, you'll love the result! 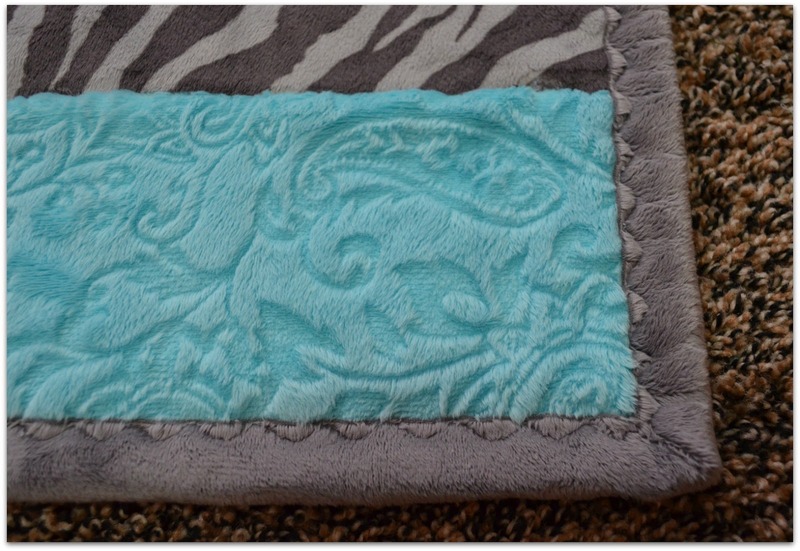 6) Binding: Quilts using plush fur may be bound with regular double-fold cotton binding, single strips of minky, or self-bound by bringing the backing around to the front. Again, a walking foot is very helpful. When applying the binding, be careful the quilt doesn't stretch too much on the stretchy edges, then be careful the binding doesn't stretch too much on the lengthwise edge. See my plush fur binding tutorial: HERE. I prefer a 2-inch strip using 1/2” seam allowance, sewn to the quilt back then brought to the front to finish with a serpentine stitch. 7) Care & Cleaning: This product may be washed and comes out just as luscious as before it went in the washer. It doesn't shrink or fade, pill or shed. Machine-wash cold, tumble-dry low, or hang to air dry. Do NOT use fabric softener. Instead, a dryer sheet is sufficient to take out any static. Keep it clean and it will last forever. Thanks for these tips. I recently backed my first quilts with minky and it really did slip all over, but it has such lovely feel that i absolutely want to use it agin. Great tips about Minky! Thank you!